Biddyosa Oil and Gas (Biddyosa) is one of the Africa’s leading suppliers of specialised, high-quality, operationally efficient offshore cargo-carrying units, cabins, tanks and well services. Biddyosa offers a full range of high-quality and new-build products, designed and manufactured in accordance with DNV 2.7-1 / EN 12079 standards, in addition to ISO 9001, ISO 14001 and OSHAS 18001 procedures. The company provides in-house visual and magnetic particle inspections performed by qualified test engineers, in accordance with national and international standards. Proof load testing is independently undertaken by a reputable test house. Containers are subjected to load testing in accordance with statutory requirements. Available 24h a day, 365 days a year, the company is committed to building long-term business relationships, while consistently delivering high-quality units, on time and wherever they are required. 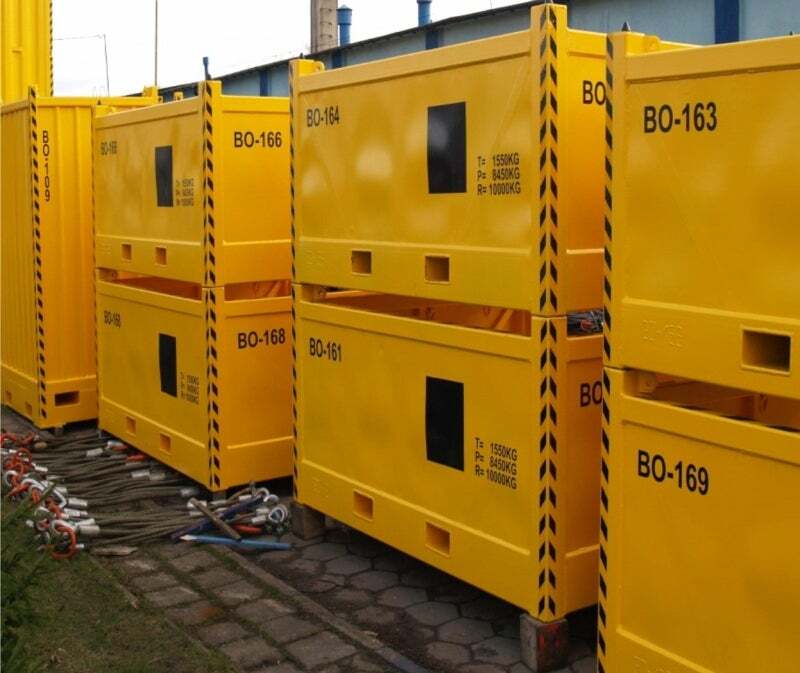 Biddyosa provides a range of A60 DNV 2.7-1 / EN 12079 offshore engineering workspace, temporary accommodation and ancillary modules to the energy sectors. Also available in 7.6m and 6m, Biddyosa’s 10.3m accommodation modules can be linked and stacked to form accommodation complexes complete with facilities, including galleys, mess rooms, recreation areas, medical rooms, meeting rooms and laundries. The A60 fire-rated modules are designed according to DNV 2.7-1 / EN 12079 specifications, and are equipped with a programmable logic controller (PLC) based fire and gas detection system fitted as standard for improved personnel safety. They also feature a quick and easy hook-up provision plug for access to on-board piping and electrical services, an integrated split air-conditioning system and under-floor heating. Biddyosa’s modules are designed for easy linking and stacking advanced, high-integrity steel structure and redesigned layout allows flexible use of space. They feature a contemporary internal finish with quality fittings for maximum comfort, and optional fire escape hatches can replace windows. Biddyosa provide a complete range of 10.3m and 7.6m workspace modules, which feature flexible internal layouts that are customisable to the client’s requirements. Standard workspace modules are compliant with DNV 2.7-1 / EN 12079 standards, and include galleys, mess rooms, locker rooms, gymnasiums, recreation rooms, medical suites and laundry rooms. The modules feature an air-conditioning unit with individual thermostat control, a PLC-based fire and gas detection unit, category II lighting and low-brightness, and high-quality fixtures and fittings. Biddyosa’s 6m, 4.8m, 4.5m and 4m engineering modules provide a safe and comfortable fit-for-purpose working environment. The range of fit-outs includes office, laboratory, coffee shop / tea shack, LWD / MWD / test cabin, mud logging cabin, workshop, wireline support and ROV cabins. A variety of Zone I, Zone II and safe area modules are also available. IceBlue Refrigeration Offshore supplies DNV 2.7-1/EN 12079 certified refrigeration and freezer modules, which are ideal for the efficient transportation of products that need to be stored in a temperature-controlled environment. The range includes 2.5m, 3m-high cube, 3m Zone II and 6m dual zone refrigeration modules. With a stainless-steel interior, they are hygienic and easy-to-clean, featuring dual temperature settings for chiller or freezer units, in addition to digital, electronic control panels that control room temperature and cooling plant functions. Modules also have double-wing door with heavy-duty hinges, and a data logger records operational temperatures from dispatch to delivery. Ferguson is committed to ensuring that its fleet of CCUs, tanks, refrigeration / freezer modules, accommodation and engineering workspace modules meet industry requirements, through innovative design and robust build quality.